I'm so embarrassed to ask such a question here, but our molecular biology teacher told us that a double helix of DNA was composed of two DNA molecules linked together by hydrogen bonds. The thing is, until now, I always thought a DNA molecule was composed of two strands, those being polynucleotides, both of them being linked together, and I can't find a link which is saying the same as my teacher, even if it seems technically correct to call a double helix a dimer of two DNA molecules. .. our molecular biology teacher told us that a double helix of DNA was composed of two DNA molecules linked together by hydrogen bonds. Respectfully, your teacher is incorrect. A single, double-stranded DNA molecule is comprised of two helical shaped polynucleotides, and are connected together via hydrogen bonding. A DNA molecule consists of two long polynucleotide chains composed of four types of nucleotide subunits. Each of these chains is known as a DNA chain, or a DNA strand. Hydrogen bonds between the base portions of the nucleotides hold the two chains together. So, it would seem that your teacher is referring to each polynucleotide, a.k.a. DNA strand, as a DNA molecule. Instead, she should use the verbiage: a single DNA molecule is composed of two DNA strands, which are helical-shaped polynucleotides. Hmm, I think that the teacher is actually correct and that the previous explanation, although very nicely referring to text book diagrams, is a little misleading. The issue here is the nature of a hydrogen bond within the DNA structure. Within a chemical context, generally a molecule is a collection of atoms primarily bonded together via covalent bonds. Hydrogen bonds, by their very nature are transient - if they weren't then the double stranded DNA wouldn't be able to opened for reading! So, a strand of DNA, from the 5' end to the 3' end is one molecule. The reverse complement strand to this is another molecule of DNA. This is important as if you were carrying out a PCR reaction (for example), you would use single, stranded DNA as primers - so this would be a molecule of DNA. Also, if we were to use hydrogen bonds as a means of defining a molecular species, then water would only be one molecule - all of those H2O molecules interact via hydrogen bonds with each other! But what about the double helix structure? 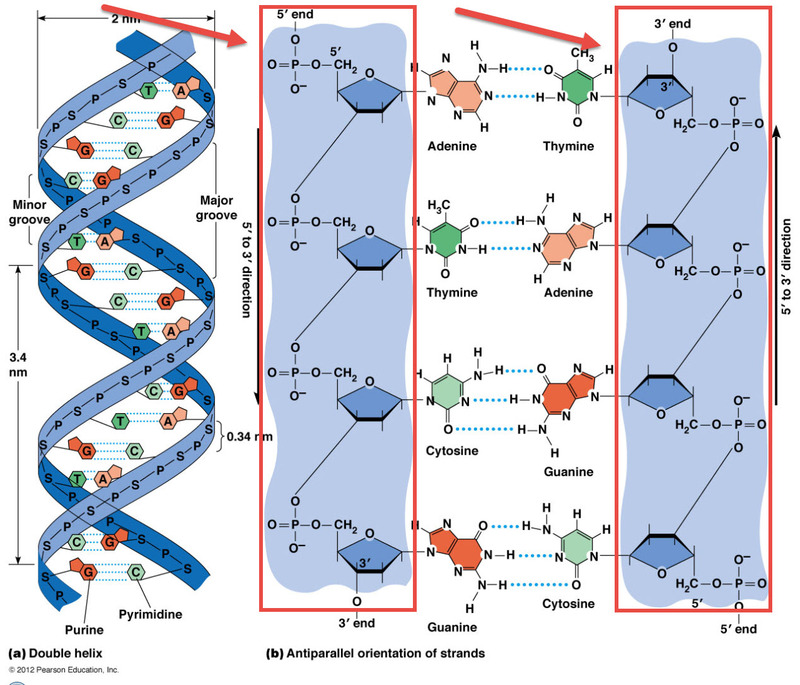 Well this is a consequence of the chemical structure of each nucleotide (and the chemical properties of those atoms), aided by the hydrogen bonding to tightly pack the atoms together - it's a form taken by the thermodynamics of the inter-molecular interactions between the two molecules of DNA. So, a strand of DNA is a molecule. Two strands (two molecules) of DNA give us the natural, stable, helical form. Not the answer you're looking for? Browse other questions tagged dna terminology or ask your own question. Is DNA a single molecule? How many nucleic acids is there in “one molecule of DNA”? How many polynucleotides are there in one molecule of DNA? Is a single polynucleotide necessarily and always a nucleic acid? Can two denatured DNA strands reassociate? Do single nucleotides spontaneously bind to ss DNA? How many nucleotides in the DNA molecule?